Introducing Mineral Dirt® 180 Liquid! 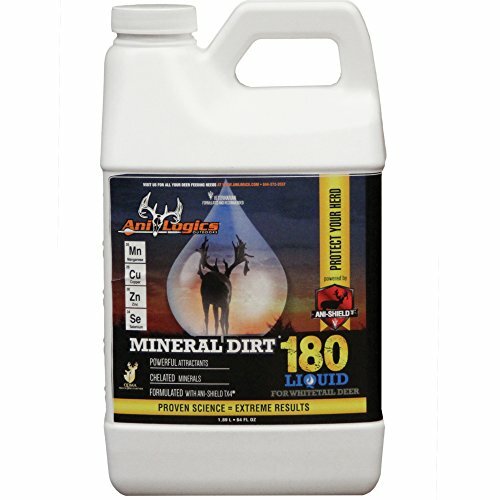 The same great formula used in Mineral Dirt® 180 and Ani-Mineral BlockTM is now conveniently available in liquid form. It's conveniently ready to use with no mixing required. It provides important bone building minerals like copper, zinc, selenium, and manganese plus Ani-Shield TX4® Technology to create a beneficial mineral lick. Our minerals are chelated. The chelation process makes minerals more available and easily absorbed by whitetails. In addition, Mineral Dirt® 180 Liquid offers incredible attraction! Pour out anywhere you want to attract and hold deer.